Project reporting is a very popular capability of our commercial products adding great value and saving PM’s loads of time. 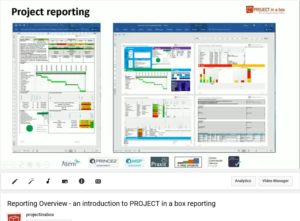 You can find out more about project reporting with the 4 min Reporting overview video on either You Tube or on our website. Your projects contain lots of data in plans, logs, registers and also custom sources from Project, Planner or Excel files. When you run a report the system gets the data from your sources and uses this to create the report. Depending on the type of project reporting requested it may also include status and commentary information provided by the PM. Your report can also include properties and assurance data it has been auto generating for you. Finished reports are then presented to you for review in either HTML, Word or Excel format. You can then print, save or use the Publish option to share them with members of your project team. Automated email notification links can also be sent to the team members. Branding and styling of reports can be modified as can the data sources used and the types of analysis undertaken. Therefore giving you both an easy to use and powerfully extensible capability. You can view the 38 min project Reporting explored video on either You Tube or on our website. Permissions and licence types control which users have access to report production. Publishing means these users can easily share generated reports with a much wider audience. This is very popular for project boards and line of business reporting. You can also roll up your project data to programme and portfolio levels. Many customers identify the time, cost and quality savings of this capability alone as sufficient to justify their investment. As is usually the case with PROJECT in a box we give you a great solution off the shelf and the opportunity to modify if you wish. Your standard system includes a set of report layouts and pre-packaged saved report types. These report templates align with the data collected from projects based on the standard Method Templates. When you are ready to go further you can switch on and off items, change the views which control plan, resource, risk and issue report content and simply save your new report definition for private use or for others to use too. You can also go much further with your own layouts and custom content, much of it you can do yourselves or we can assist. Because no programming changes are required these changes are quick and easy to learn. Project Statement – a simple one page summary of the project. Sponsor Report – our poster report is four pages providing more detail. Annual Review – a look back over the project performance for 12 months. Daily Scrum – brings together the materials required for daily scrum meeting. Project Assurance – less graphical and more details, great for project audit. Portfolio Poster – data rolled up across a set of projects into summary only. Portfolio Benefits Review – roll up of benefits, with project level statements included for detail. Ideas Portfolio – review the set of ideas proposed and selected in the funnel. 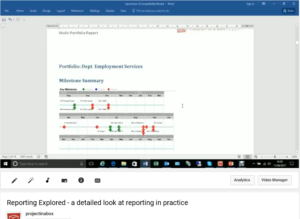 Multi Portfolio Report – here rolling up three department portfolios to organisation level. You can also download the full pack of reports as a single zip file. Community Edition – No project reporting provided except that within Planner. 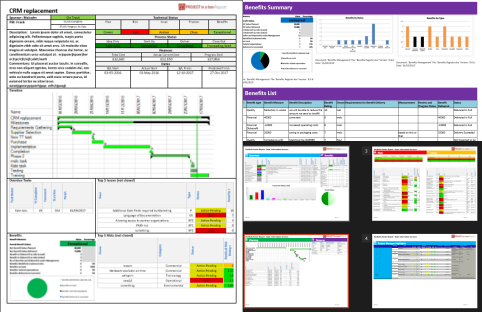 Personal Edition – Core reporting supported including producing dashboards, project and portfolio reports. Also project document assurance. The report publishing capability is not available on Personal Edition. Small Team Edition – Full project reporting and portfolio reporting capability supported on Small Team Edition. Only two users will be able to produce reports and can then publish them to the Report Library to share with the rest of the team. Enterprise and Live Edition – Full project reporting capability. You choose how many ‘Manager’ type users you want to have the ability to produce and publish reports.